Nestled within the sweet seclusion of the Ozark Mountains near the glistening waters of Table Rock Lake, Pointe Royale Resort in Branson MO exposes guests to the best of Branson with elite accommodations and entertaining activities and attractions in an enviably beautiful location. At Pointe Royale Resort in Branson, guests can enjoy suites with immense floor plans, cozy details, high-end televisions in every bedroom, Wi-Fi access, and expansive open-air decks for taking in the surrounding scenery. Community amenities available at the resort include a fitness center, multiple playgrounds, three pools (indoor, outdoor, and kiddie), tennis courts, an on-site restaurant and clubhouse, a pro shop, and a lounge. Of course, we’d be remiss if we didn’t mention The Pointe Golf Course, which is an eighteen-hole masterpiece of a course with twelve of the eighteen holes having water hazards. 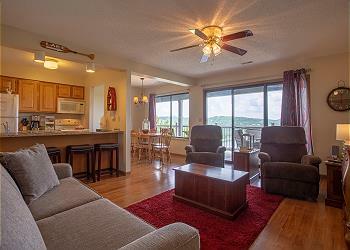 Situated along Table Rock Lake, Pointe Royale Resort allows guests to experience the best of lakeside living. Enjoy fishing, boating, swimming, and other water-based activities and sports from one of the lake’s many state marinas, which also offer charter services and equipment rentals if you’re not sure where to begin. The resort is located across from Lawrence Welk Theater, making it easy to catch your favorite Branson shows. Downtown Branson is about twenty minutes away and has a variety of live shows (fitting, as it’s the Live Entertainment Capital of America), restaurants, and shopping options like Branson Landing. Pointe Royale Resort is also just a short drive away from Silver Dollar City, the famous old-fashioned Ozarks-themed park with roller coasters, amusement rides, live shows, handmade crafts, and more. Contact our reservations team to find out more information on the Pointe Royale Resort and other lavish resorts, fun-filled activities, and intriguing attractions that you’ll come across in Branson when you book your stay through Sunset Nightly Rentals today!